These little guys practically match my naval elephant! Intricate details. Very pretty. Will buy from them again. Local artisan Kung handcrafted this charming sterling silver earrings. The elephant is a symbol of strength, good luck and perseverance. Perfect for your natural beauty and unique style. Love my New elephant earrings Great quality excellent buy Not to small, but so elegantly just right for a perfect fit on the ear lope. Metal is good sterling silver. 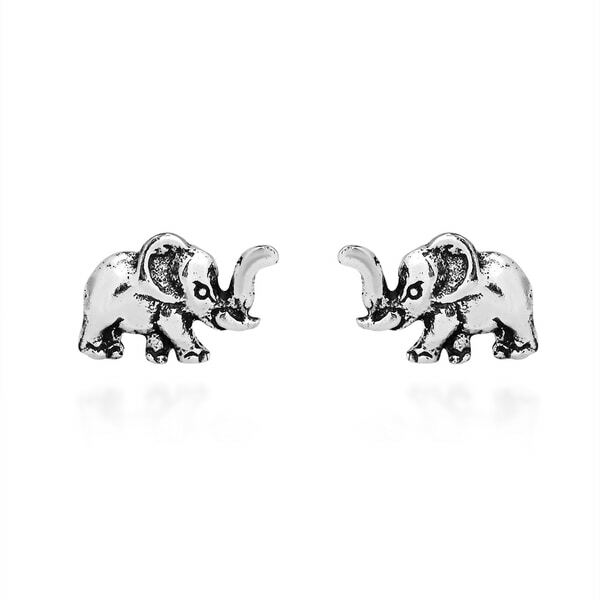 I purchased these stud earrings because they were really cute, and the elephant is the symbol of my sorority. They were surprisingly sturdy and of good quality with intricate detailing. Perfect size for my niece’s ears! She is 11 years old and pretty picky! She LOVES elephants but is particular about how detailed her elephants look! Thankfully, these were approved! Lol! Adorable and shiny! The earrings exceeded my expectations and, in spite of my ordering them very late, came in time for Christmas. They were my daughter’s favorite gift this year. I bought these for my daughter Casey for her birthday. She loves elephants and I was worried that they would be too small or too big, but I worried for nothing. They were perfect and she loves them! So delicate. I got these for my child soon after she got her ears pierced, they were perfect! These were for my granddaughter who loves elephants. They are petite but just what she wanted. Ok but very small, would like to see it a bit bigger to show details. The description said petite. These are really children's earrings. Cut, but too small. I got these as a gift for my granddaughter. She loves elephants. She loved them. I myself wish they had been a little bigger. If by “handmade” they mean someone uses their hands to pour the metal into a mold that doesn’t match the other one, then sure, they’re “handmade”. Top Trends in Handcrafted Jewelry from Overstock.com. Our guides provide customers with information about the top trends in handcrafted jewelry.